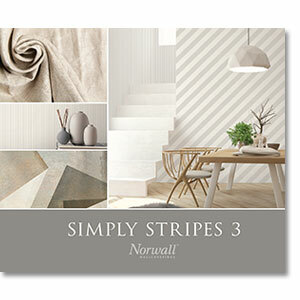 Simply Stripes 3 has boundless possibilities to make grand design differences in your space. Whether the look you are going for is classic and elegant, edgy and wild or powerful and modern, this wallpaper book is like a resource book containing stripes of many choices. An array of widths and colours, these stripes will add energy to your space or they can be used in a subtle fashion. It’s a great way to get a “decorator” look by adding pattern to your space. Boost your room into a playful, bold and fresh feel with multiple coloured stripes. Hung vertically will give your rooms the appearance of added height. Big or small, ceiling or wall, stripes will also pair wonderfully with other designs.